New research, which appears in the journal Proceedings of the Royal Society B, sheds light on how the damage in the brain caused by a stroke can lead to permanent vision impairment for approximately 265,000 Americans each year. The findings could provide researchers with a blueprint to better identify which areas of vision are recoverable, facilitating the development of more effective interventions to encourage vision recovery. Pictured above: The left image shows degeneration that typically occurs in the eye (lower right corner) after a patient has a stroke in the visual processing area of the brain. The area of degeneration corresponds to the location of blind areas of the patient's visual field. Carnegie Mellon and University of Rochester researchers found the eye is less likely to degenerate when the brain continues to respond to visual stimuli despite the patient's blindness from the stroke. 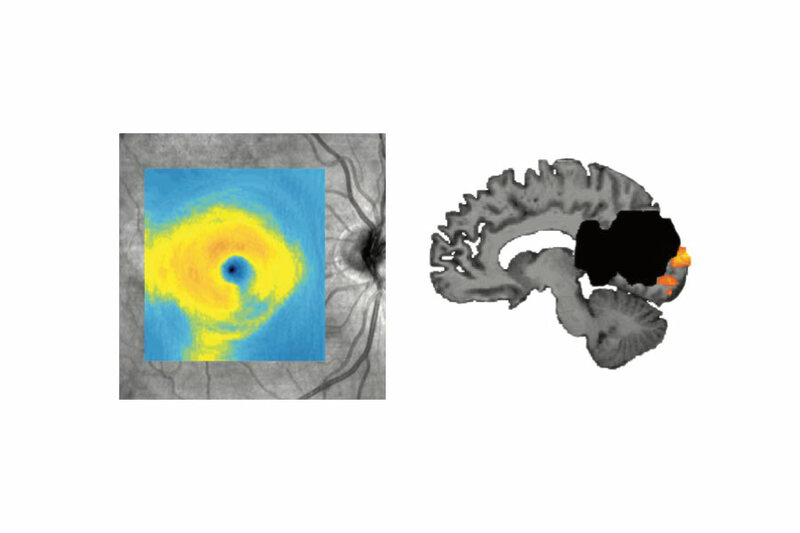 The right image shows lesion in black and visual cortex activity to stimuli presented in blind areas of the patient's visual field in orange.